My name is Jess, I live in a mining town in northern WA called Port Hedland. My wee family includes my gorgeous 5 year old son Elijah, Fab husband Tavis, Ruby the plump Labrador & Charlie the elderly Golden Retriever. After moving to Port Hedland 4 years ago I found myself in need of a hobby! It took me a good year or so to really hone in on what I wanted to do. 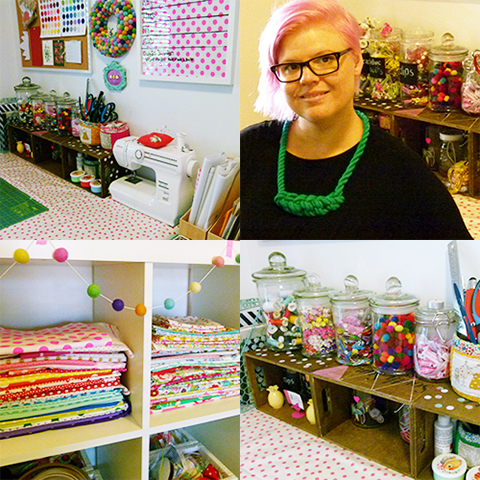 After making accessories for family and friends I realised how much I loved it and Rainbows & Whimsy was born! I make accessories for girls. I have also started dabbling in decor items for girl's rooms which I hope to launch in my store soon. I guess you could say my signature would be bright, happy, whimsical pieces. I want my accessories to be fun, functional & simple! I love using both new and vintage materials. I use designer fabrics, paper flowers, colourful beads, vintage finds, lot's of glittery elastics & anything else that tickles my fancy. Apart from my rather wild imagination I get inspiration from everywhere! Interior design, children's fashion, art, music, other crafty maidens & the world around me! I have always loved creating! As a child I was always happy when I was kneel deep in glue sticks, glitter & colourful paper. I have always had a passion for painting & love creating mixed media art. After moving to Port Hedland I purchased a sewing machines & slowly but surely taught myself the basics. I dabbled in making children's clothing but found my true passion in creating lovely accessories. I came up with my business name rather easily. I LOVE colour, hence the Rainbows. I love everything whimsical & fun & don't like to take anything to seriously so using Whimsy made sense! Put the two together and you've got Rainbows & Whimsy. I love nothing more than learning new crafty abilities! I love taking online classes. I also love visiting art galleries, reading magazines and generally immersing myself in online forums. There is such a wealth of knowledge out there in the craft community, and most everyone is so willing to share, help & motive! Get involved in online forums and groups! Really build a cohesive brand. Make sure your products, packaging, designs & log's all work together. Stay true to your own style! Whenever I have made a product because I think that is what people want, or that is what I should be doing it just flops. Trust in your designs and process and your business will be fulfilling! I love nothing more than hanging out with my wee family! We pretty much do everything together. I am definitely a book worm so love it when I have some free time to snuggle up with a good book. I also love to cook….I'm definitely someone who believes food is so good for the soul. When it comes to music, gosh I love all sorts! Music has to speak to me, make me feel something or make me want to dance. At the moment I love documentaries and I really love the show Elementary which I make sure I never miss. When it comes to films I love anything to do with super heroes and comic books. Also movies that really motivate and have something to teach us. I love books! from classic english literature, to biographies and everything in between. Jodi picoult is a great author she really gets your mind thinking about the 'grey' areas in life. Breakfast at a lovely cafe with the family, a visit to the art gallery & an afternoon spent lolling about reading and watching movies together. Bubby Makes Three - Not only does Nicole make amazingly gorgeous children's goodies, she has also been amazingly supportive of my wee business.